The objects used to celebrate Shabbat, the Sabbath, are used weekly and are a part of most Jewish homes. The meaning of Shabbat as explained by Rabbi Abraham Joshua Heschel in his book The Sabbath, “…is to celebrate time rather than space. Six days a week we live under the tyranny of things of space; on the Sabbath we try to become attuned to holiness in time. It is a day on which we are called upon to share in what is eternal in time, to turn from the results of creation to the mystery of creation, from the world of creation to the creation of the world.” The ritual of welcoming the Sabbath, which includes lighting two candles and blessing bread and wine, punctuates the week and creates a transition from the ordinary workweek, to a day of rest and relaxation. The ritual creates a pause, a moment to reflect and appreciate. The Shabbat candlesticks and kiddush cup are used in this ritual. Kiddush means sanctification in Hebrew. 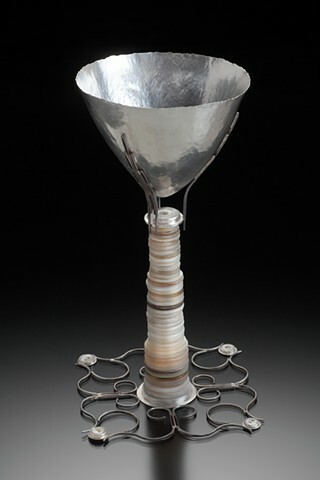 Kiddush cups are used on holy days, such as the Sabbath, as well as weddings, baby namings, and other life-cycle events that call for a cup of wine.